I was a huge wrestling fan growing up. I was a little Hulkamaniac and I love watching Hulk Hogan kick out of his opponent’s finishing move, hulk up and then finish him off in a little under two minutes afterwards. It was a very simple time and wrestling wasn’t as “realistic” as it is today. The World Wrestling Federation (WWF) as it was known today pretty much had a monopoly with wrestling. They had an amazing stable of colorful characters but none of them could stand up to the Hulkster, both in the ring and in popularity. That is, until, The Ultimate Warrior stepped into the ring. To be honest, there wasn’t really anything special with the Ultimate Warrior’s in-ring debut. He was a new wrestler with a very muscular build. But he was just starting out. James Hellwig, the Ultimate Warrior’s real name, had yet to develop the character that would eventually become one of wrestling’s biggest icons. While I loved Hulk Hogan, I only got to see him wrestling very sparingly. Maybe I got to see him wrestle once a month on Saturday Night Main Event when they were broadcasting it over the old FEN channel here in the Philippines. But I got to watch a heck of a lot of matches of the Warrior. He would just steamroll over his opponents in a couple of minutes. And it was just amazing to watch! These incredibly short matches made the Warrior seem to be more than just a mere man or even just an ordinary warrior. No, it seemed to me his name, The Ultimate Warrior, was very apt. But at times he seemed to be much more than that. He was a force of nature! He would usually feud with a lot of the bad guys (called “heels” in wrestling speak) who also claimed they were strong. He would fight against the likes of Hercules Hernandez and Dino Bravo. His career skyrocketed when he won the prestigious Intercontinental title from the Honky Tonk Man. For me, it was a shocking win, especially since the Honky Tonk Man (the man to have held the title for the longest period) had just concluded a long feud with Brutus “The Barber” Beefcake. During the inaugural SummerSlam pay-per-view, Honky Tonk issued an open challenge to anyone in the locker room. Warrior accepted the challenge and ended Honky Tonk’s 454-day reign as the Intercontinental Champion ended after the 27-second match. But that still wasn’t Warrior’s biggest accomplishment. After a while, there was talk of having him feud with the WWF’s biggest draw and the Heavyweight Champion of the time, Hulk Hogan. It was officially announced that the two of them would clash in Wrestlemania VI. I was kind of torn at the thought of the two fighting. Although I was a huge Ultimate Warrior fan, I also considered myself a little Hulkamaniac (even if I didn’t abide by the “say your prayers and take your vitamins” tenants the Hulkster would preach). The buildup for this was huge! I was incredibly giddy to see Hulk Hogan take on The Ultimate Challenge. Even when I was young, I could sort of predict who would win a match because, well, wrestling is scripted after all. But I couldn’t for this match. I couldn’t really picture any of them beating the other. When Hogan popped up after Warrior’s gorilla press and splash combination finisher, I was sure the Hulkster was going to get the win. But when Warrior dodged the legdrop and finally pinned Hogan for the three-count and become the new Heavyweight Champ, even I was surprised! After this, things got… weird for the Warrior. 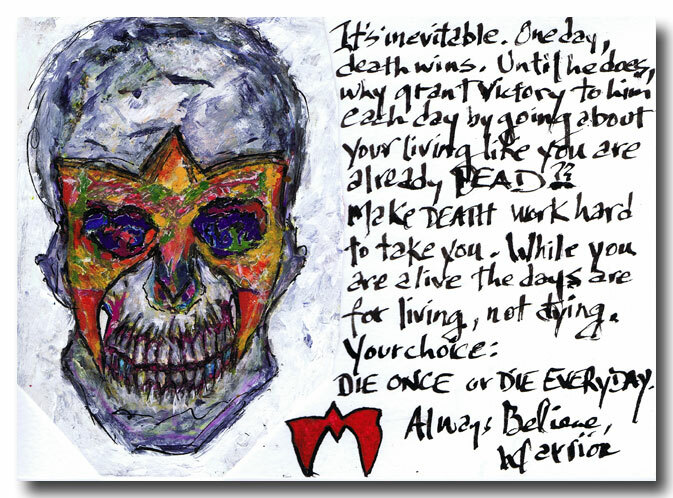 I watched “The Self-Destruction of The Ultimate Warrior,” a biased documentary detailing the weird demands of the Warrior. According to the film, Warrior demanded to get more money from the WWF just before performing on a pay-per-view or else he’ll walk. The company gave in to his demands but, after the event concluded, promptly fired Warrior. While I can’t say the “facts” on the film were true, it certainly explained a lot as to why he left so suddenly from the company. He did return to the WWF after a time but left shortly afterwards (the details are more iffy this time). He then showed up in WCW but he had this incredibly strange storyline wherein only “Hollywood” Hulk Hogan (and the viewer) could see Warrior but the other wrestlers couldn’t.. it was a mess. Even the “revenge” match between Hogan and the Warrior was ugly. It looked like Warrior’s wrestling days were over after that. Warrior retired from wrestling soon after and decided to become, of all things, a political pundit and motivational speaker. It was odd to see a man who used to be an unstoppable force of nature turn into something like that. I tried following what he wrote but the things that he said just didn’t connect with me in any way. I lost track of what the Ultimate Warrior was doing afterwards. When The Ultimate Warrior was announced to be the part of the WWE Hall of Fame this year, I couldn’t believe it! This was a man who was publicly humiliated by the same company! I never expected him to accept the invitation to be part of the WWE again! But, there it was! When he gave his acceptance speech during the Hall of Fame ceremony, it was evident there was something off about him. He definitely wasn’t the same crazy Warrior anymore. He looked old, sweaty and beat down. You may say that’s because wrestling takes an awful toll on the body and you’d be partially right. He looked worn out even walking to the podium accompanied by his two daughters. Even during his final appearance in the April 7 edition of Raw, he seemed tuckered out after he did his trademark rope shake. But he managed to give a moving speech afterwards about leaving a legacy after you leave the mortal world. Warrior passed away several hours after that Raw. His death came as a shock to me. I was at work when I glanced at the monitor of one of my co-workers showing the headline. I hoped it was a weird, horrible joke but, sadly, it was the truth. I guess he kind of new his time was up and that was the exact reason why he decided to make peace with the WWE. He didn’t want a legacy of being bitter with the company that made him a household name, even if that company did treat him like dirt when they released that movie. I may not have a lot of love for the latter part of his career but I will always have fond memories of him running into the ring, shaking the ropes and annihilating his opponent in a couple of minutes. RIP, Warrior. You’re gorilla pressing God now. Do you have fond memories of the life of the Ultimate Warrior? Whatever they are, please leave them in the comments section below.